Add cantaloupe pieces, soda and ice to a blender. Blend until ice is mostly broken up. Add banana and sugar and puree mixture until smooth. Add more soda as needed if mixture is too thick. Serve immediately. 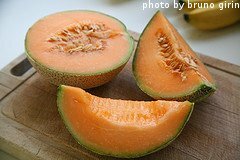 Add cubed cantaloupe and orange juice to a blender or food processor. Blend until smooth. Add mint leaves, lime juice, lime zest, cinnamon and salt and blend again. Transfer mixture to a large bowl. Cover and refrigerate at least 4 hours or overnight. Serve chilled and garnish with a sprig of mint. Cut prosciutto into strips about as wide as the cantaloupe cubes. Wrap a strip of prosciutto around a piece of cantaloupe and secure it with a toothpick. Add one drop of balsamic vinegar on top of each piece of melon. Serve immediately. To a bowl, add cantaloupe, lemon juice, sugar, flour, 2 tablespoons melted butter, balsamic vinegar, cinnamon, nutmeg, and vanilla extract. Mix together until well combined. Pile mixture into a greased 9 inch square baking dish. Spread dry cake mix even over the top of the cantaloupe mixture. Drizzle 1/4 cup melted butter over the top of the cake mix. Bake in preheated oven for about 45 minutes, or until the top is nicely browned. May be served warm or cold. Whisk together instant pudding, milk and cream in a bowl. Whisk until smooth. Add whipped topping and whisk again until smooth, working quickly before the pudding has time to set. Stir in shredded cantaloupe and pour immediately into popsicle molds. Freeze for at least 6 hours, or until firm. Prepare gelatin according to the directions on the package. Let set up in refrigerator. In a small bowl, mix together graham cracker crumbs, white sugar, cinnamon and melted butter. Press into the bottom and sides of a glass pie dish. Blind bake crust in preheated oven for 15 minutes. Remove from oven and let cool. In a mixing bowl, whip cream cheese until fluffy. Mix in powdered sugar and then beat in 1 container of whipped topping. Spread this mixture onto the bottom of the cooled graham cracker crust. Stir cantaloupe into the cooled gelatin and then pour mixture over the cream cheese layer. Evenly spread remaining container of whipped topping over the cantaloupe and gelatin mixture. Chill pie for several hours before serving.